If you know me, you know that I love throwing a good party and I tend to go overboard. If you don’t know me, you probably could have figured that out all on your own! I’m not someone who does things the easy way either. Nope, store bought decorations, invitations, and favors have never been my thing. Not that there’s anything wrong with store bought party stuff, just saying, it’s not my thing. I know I have mentioned before that my children (and myself who am I kidding) love American Girl Dolls. We share our house with several of them but one of our favorites is Lizzy, T’s Bitty Baby. She loves to push her in her stroller, sit her in her highchair, and carry that diaper bag everywhere we go. When baby sister got old enough to take an interest in baby dolls, she pretty much kidnapped Lizzy for good. I had officially decided that A would be getting her very own Bitty for her 2nd birthday in December. Now P says she wants one too of course! Got to have 3 of everything in a house full of girls you know! Anyhow, a couple of months ago we got wind that AG was planning to release their revamped line of Bitty Baby at the end of August. T was ridiculous amounts of excited so we had to do a little internet research to see what changes were being made exactly. We discovered that there would now be 11 bittys to choose from, a whole new line of story books geared towards the younger AG lovers, and lots of exciting new accessories. We also stumbled upon the House Party website. How on earth had I never heard of House Party before?!?!?! My love for over the top parties and my love for free products combined into one fabulous website!??!?! If you don’t know about House Party, you NEED to check them out at http://www.houseparty.com and sign yourself up to host your very own! American Girl teamed up with House Party to select 1,000 or so lucky ladies to host a Bitty Baby tea party to introduce new Bitty to the world! Naturally we signed ourselves up to be hosts and patiently waited for what seemed like forever to find out if we had been chosen or not. I have to tell you I had pretty much psyched myself up for disappointment because I never win anything. Seriously. NEVER! Imagine my joyful surprise when I checked my email on host picking day to discover that I had been selected!!! So in about a month we will gather around with some of P & T’s favorite lil’ ladies and have a tea party to welcome our new Bitty home. This is the new Bitty Baby. Her face mold has been changed as well as her hairline. She now comes with her own full color story book called “Bitty Baby and Me” and a cute little wishing star. Her little sleeper outfit has changed too and is super cute with little ruffles. Can’t wait to see her in person. T is ridiculously excited! American Girl and House Party are sending us and our guests lots of goodies and naturally I had to start whipping up my own special touches immediately! 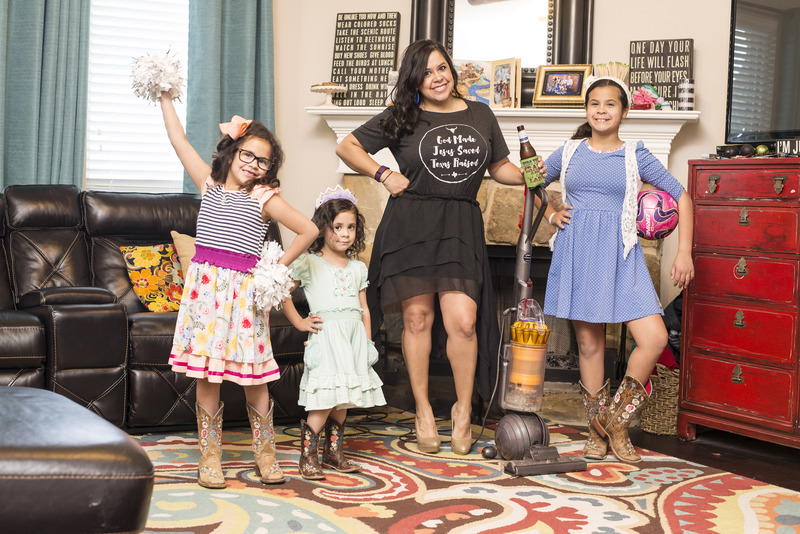 I don’t normally share my party plans pre-party because I like for my guests to be pleasantly surprised by my personal touches but I figure there are so many other host mamas who could probably benefit from my hours of computer design work too. My husband always says nothing in this world is free but why I ask, WHY!?!?! We mamas have braces, shoes, school, and dolls to pay for by golly. Shouldn’t something be free from time to time? 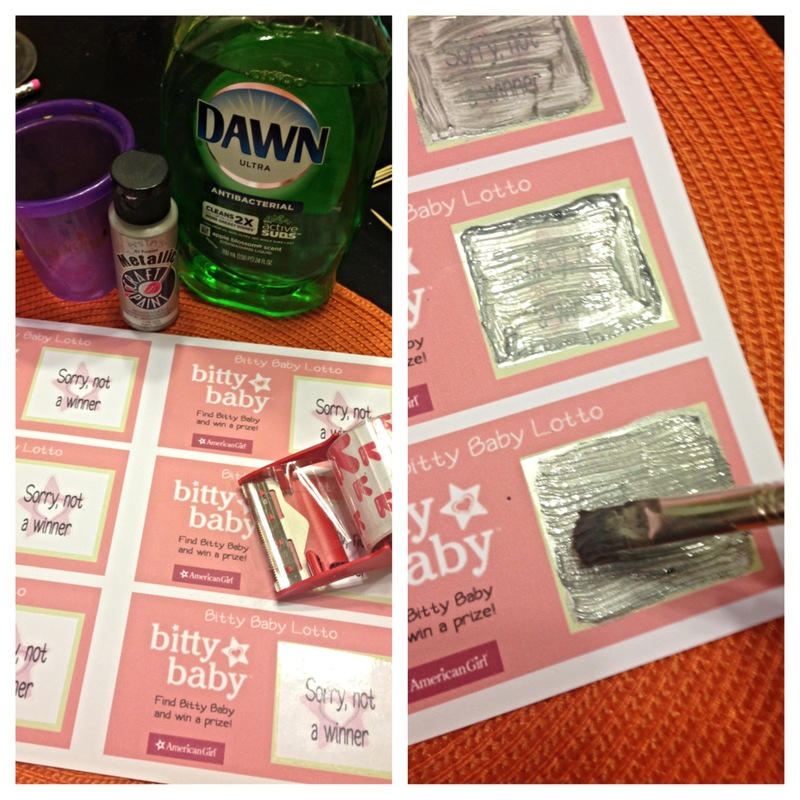 So here you go fellow Bitty Baby House Party Hostesses some FREE downloadable printables for your own party! 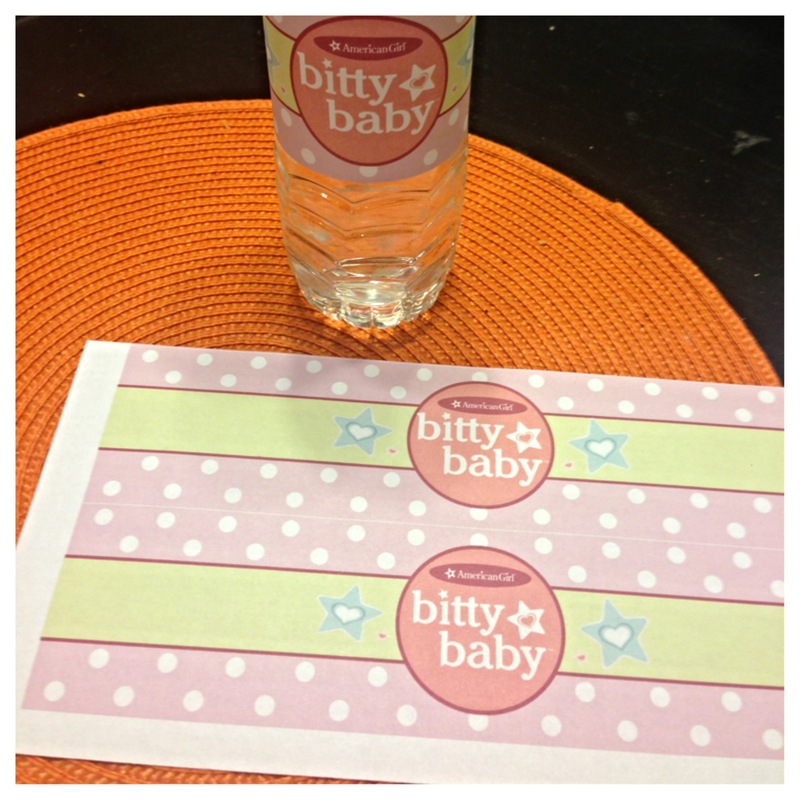 I know I’ve already emailed several of you the water bottle labels and cupcake toppers but I’ve added a few other goodies for your printing pleasure here! Just click on any of the links at the very end of this post to download whichever party goodies you would like. When printing make sure you select “scale to fit (print entire page)” so that none of the design is chopped off. Some printers may have you select to print at 90% instead of 100%. Hope that make sense. 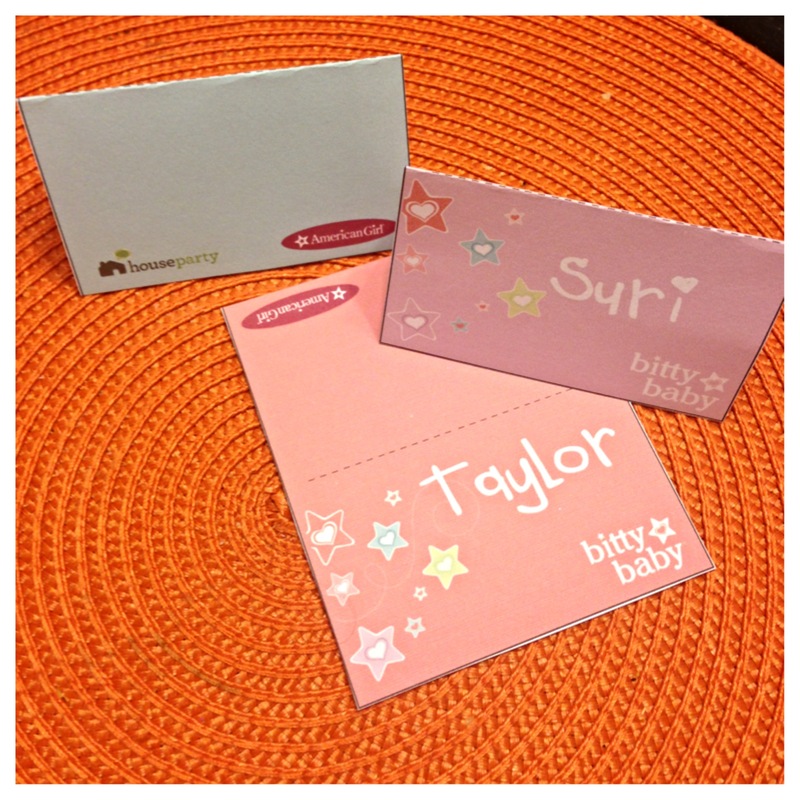 To create the place cards, simply cut each one out around the solid black lines and fold at the dotted line. I used the computer and a snazzy font for our names but you could easily handwrite them if your handwriting isn’t chicken scratch like mine. The water bottle labels are pretty self explanatory. Just cut them out and use tape to secure them. If you plan to keep them in an ice bucket you may want to laminate the labels or cover them in clear tape to make them waterproof. 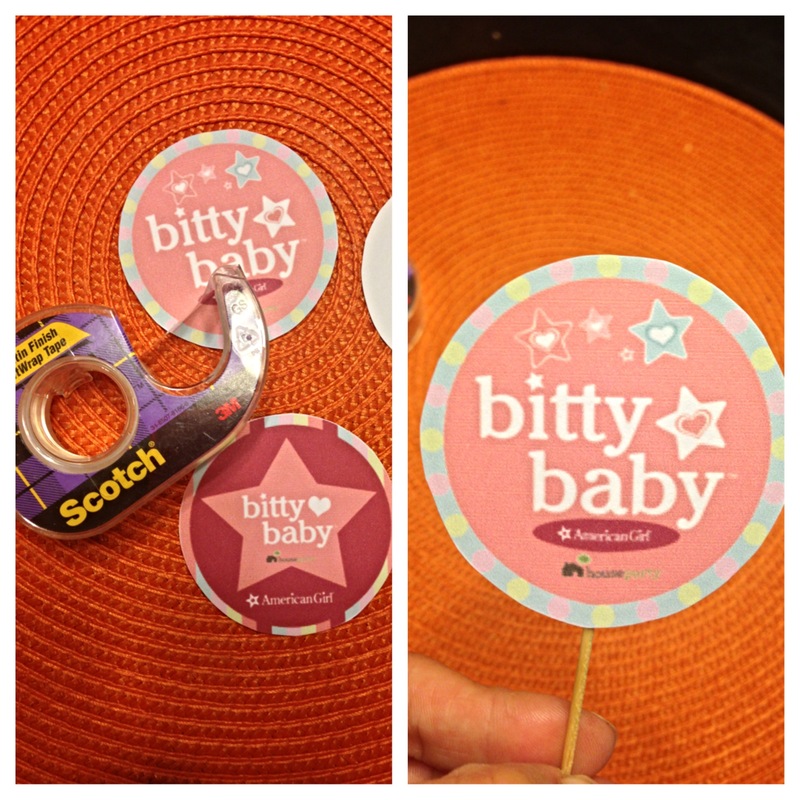 You can cut the cupcake toppers out by hand or use a circle shape maker if you have one. I used to have one purchased at Hobby Lobby but it was M.I.A. so I had to do them the old fashioned way. Once they’re cut out just tape or glue a toothpick to the back. If you’re feeling extra ambitious you can make them 2 sided by sandwiching the toothpick in between 2 circles! I personally think the fact that I created them, cut them, and taped them at all was ambitious enough for me! 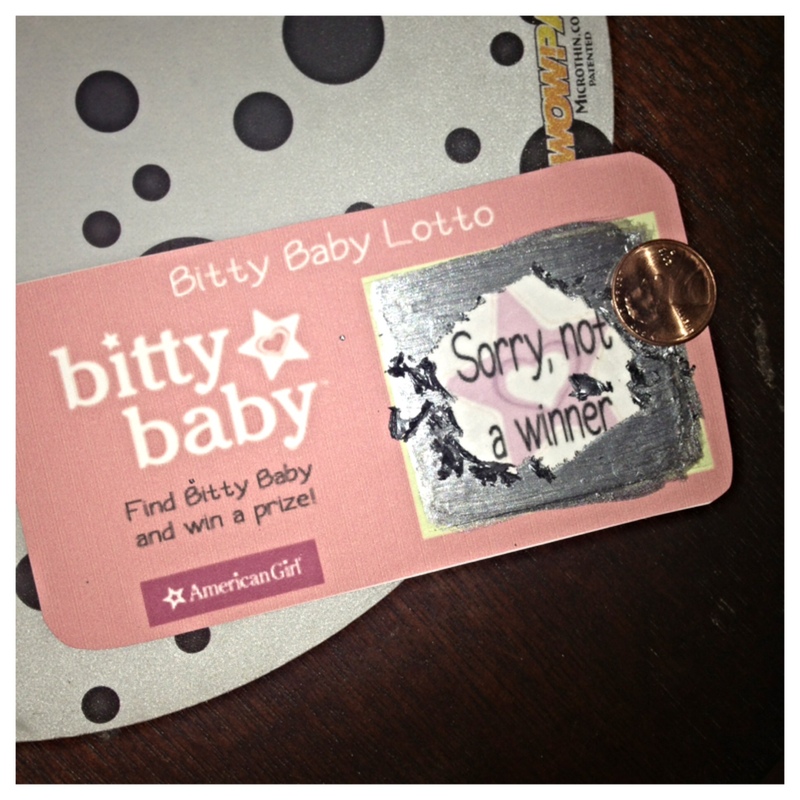 To make the Bitty Baby scratch off lotto tickets you’ll need to print 1 copy of the page with the winning ticket and then a couple without. You also need a small paintbrush, some clear packing tape or wide shipping labels, dishwashing liquid, and silver paint. Cut your clear tape or clear shipping label to fit the scratch off area and place it over the print. In a cup or bowl that’s okay to get paint in mix 1/2 dishwashing liquid and 1/2 silver paint (or any color of metallic paint you choose). Paint over the labels or tape until you can’t see what’s underneath anymore. Mix a little bit of black in your silver for a darker better coverage if you don’t want to have to do so many coats. I did and still had to paint on 3 coats! If you’re using the shipping labels it’ll probably be much easier to paint them before you cut them and stick them on. It was tough to stay in the lines with the tape. Once the paint has completely dried (overnight would probably be best but I was dying to try it so waited an hour), cut out the lotto cards and they’ll be ready for your guests! You can pick anything you want big or small to be your door prize. I will probably do one of the new Bitty books. What a fun project! I will definitely be doing these again! I also created a party welcome banner to match and invitations too! You’ll obviously have to add your own party information. The invitations are formatted to a 5×7 size. Thank you so much! I’ve been doing so many parties lately (I’m a make it myself kinda gal, too) that I was running out of steam for the bitty baby party! These are awesome!! And renew my excitement. How can I download these printables? I click on them an nothing happens. Hi Gloria, you just have to click on the links provided and the PDF document will show up. Just select “file-print” and print at 90% instead of 100% for best results. If you need to make changes to any of the documents using some sort of graphic design program simply select “file-save as” and then you can save and open the document in the appropriate program. Hope that helps! OK GOT IT! YEAHHHH!!!! THANK YOU SOOOO MUCH! So wonderful! Thanks for sharing! Do you happen to have a ” birthday girl” or “happy birthday” banner in the same style as your welcome banner that I can download? Thanks so much!